Bologna holds many secrets: From the unexpected river that suddenly appears in some parts of the city, to mysterious sayings and strange images drawn under its iconic porticos, to gastronomic delicacies unique to the region. In fact, it is not salami as we know it (i.e. aged sausage, with pieces of fat clearly separated from the dark red meat) but is almost a halfway between a top quality ham and Bolognese mortadella. The surprising flavor is full of personality – it reminds me of roasted meat – and is mild. Since it is relatively lean, one can savor the taste of the meat combined with the smoothness of the fat. It is really amazing and has already become one of my favorite treats. Actually, the old recipe is kept secret by some of the few “salumai bolognesi” (Bolognese experts in cold cuts) that still produce it, but basically it consists of a mix of lean pork meat (particularly from the shoulder) cut “in punta di coltello” (with the sharp end of the knife); which is then incorporated with guanciale (a very tasteful Italian salume made with pork cheek, providing the necessary amount of fat); and then, finally seasoned with salt, pepper and garlic. This whole procedure takes place without the use of machines or mincers. It is accomplished entirely made by hand. Once all the ingredients are mixed, the compound is stuffed into an edible casing that protects the product while it’s cooked in a dry oven for 15 to 24 hours. 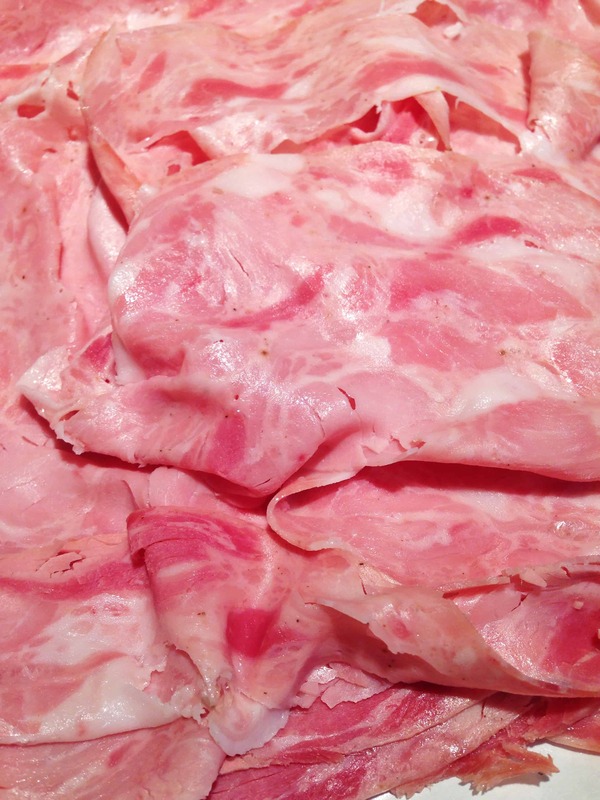 The traditional shapes are similar to the ones of the Bolognese mortadella and vary from 6 to 12kg (! ), but it’s also possible to find smaller versions. The bad news is that salame rosa becomes harder to find each day. Currently, you can only buy the delicacy in two places in Bologna: my beloved Salumeria Simoni (Via Drapperie 5/2a) and the historical Salumificio Pasquini & Bruisani (Via delle Tofane, 38). It is really a shame that a product like this is being forgotten, because we’re talking about something indeed special – both the taste and the whole tradition behind the entire production process are unique.